In a fast-paced fashion world where the treadmill is spinning at an ever-increasing rate, one Sunshine Coast designer is doing her best to slow it all down to a leisurely stroll. Pomona resident Sofia Tomkins has gone back to basics with her fashion line Lilla By Fia and she is winning over the eco-conscious market with her sustainable clothing designs. Since releasing her first collection in 2017, while still studying at TAFE, the 22-year-old has gained a dedicated following and is quickly branching out, with orders coming in from around the country. Wearing her signature natural romper, made with a blend of organic cotton and hemp, Sofia (or Fia) has her hair swept up in a messy bun and is a little shy at the attention brought about by the interview, preferring the quiet of her studio where she designs, drafts, cuts and sews her clothing before soaking them in natural dyes she creates from natural sources. The name of her label, Lilla, comes from Fia’s roots – she was born in Denmark and moved to Australia as a youngster. Fia gravitated to the word Lilla, which is Danish for any variation of the colour purple, as it is the most common tint produced by natural dyes. Her aptly named Avocado collection featured a dusty pink hue created from avocado seeds. Fia admits this process was the result of a little research and a lot of trial and error. Fia says she first came across natural dyes in a sustainable fashion component of her TAFE fashion design course and had experimented with the process a little before attending classes in the small town of Pai, north-west of Chiang Mai in Thailand, while on holiday. She credits the Pai classes for inspiring her to choose natural dyes for her label. Despite her age, Fia has already travelled extensively around the world and has chosen to pave a tougher path into fashion in order to maintain her conscious lifestyle. Her garments are made with a hemp and organic cotton blend, placing them firmly at the top of the sustainability pyramid. Fia sources the fabric from Western Australia, which imports the blend as there are no facilities in Australia capable of transforming hemp into a fibre. But this is the only component of Fia’s business that is transport-intensive. Once the fabric arrives, Fia gets to work and cuts, sews, dyes and finishes each individual piece herself. She has always been a fan of how each garment is unique when you hand-dye with natural components, so no two people will ever have the same item of clothing. It takes four avocado seeds to dye one garment and having created around 100 items of clothing since launching the label, Fia had to find a sustainable source of the vital dye ingredient. Luckily, she didn’t have to look far from home – her mother Nilla Tomkins sets aside avocado seeds from VanillaFood cafe, which she owns. All Fia had to do was wash the seeds and add them to the boiling stainless steel pot in her home kitchen and the magic would unfold. This arrangement fits perfectly into her ethos of minimising waste and having the lightest footprint possible, which she incorporates into every aspect of her business. Offcuts from her first collection were sewn together to create the changerooms that are a feature of her regular Peregian Beach Markets stall every fortnight. Extra material from the subsequent collection has been used as swing tags and clothing tags, which are printed using eco-friendly inks. “I want people to be aware of the impacts of the fast fashion industry,” Fia says. “I source natural materials that are ethical and sustainable, which give back to the environment. The environment is a big resource and for me so it is something that is worth protecting. Discovering a passion for sewing at a young age, Fia recalls one of her first attempts at creating something. “I remember sewing this felt little purse. I hand-stitched it. I was eight or something,” she says. But attending sewing classes in Tewantin under the guidance of experienced women sparked a desire to take it further and learn how to create designs, which is how she ended up at TAFE after a few years of travelling through Europe. Lilla by Fia has only had a few forays onto the catwalk so far, with appearances at a World Environment Day event last year in Cotton Tree and the TAFE graduation parade, but she debuted her Avocado collection with five new designs to great fanfare. “It was such a thrill to see people’s reactions to my clothes and to see some people already wearing them; people were already waiting to see my new stuff,” she says. 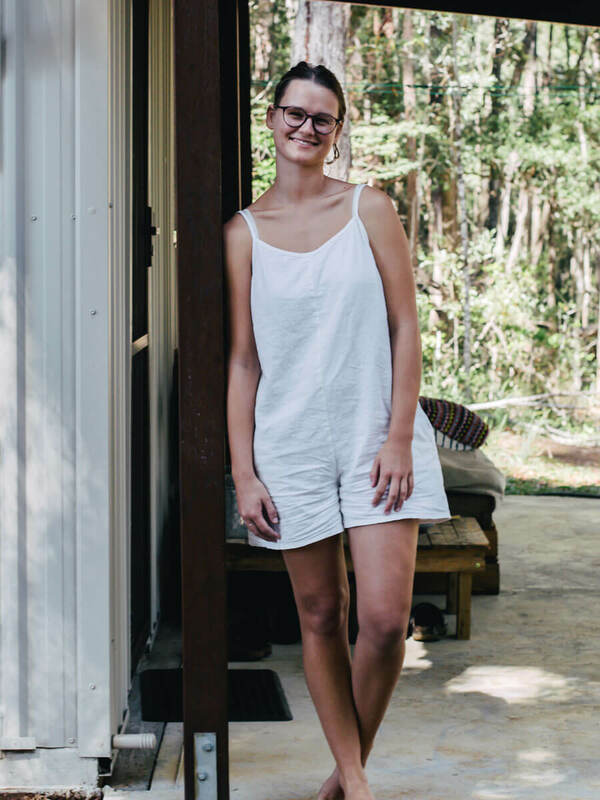 She won a TAFE design award and was selected for a coveted three-month London internship with renowned designer Karl Donoghue, which starts in April, as well as a six-month mentorship with Sunshine Coast sustainable eco-fashion label Sinerji. “It is crazy that I get to work with such talented people. I still can’t believe it; it is pretty cool,” Fia says. With 2018 set to be a huge year for the young designer, Fia is working to perfect the recipe for her Autumn collection, which she says will continue in her signature style of timeless, loose-fitting clothing, but with longer hemlines. But exactly what the next key ingredient for her next plant-based dye will be is being kept under wraps for now. In the meantime, Fia is determined to continue to champion the sustainable fashion message and beat the drum for change in the wider fashion industry.